While the General Election remains months away, it’s not too soon to start thinking about your passion for city government, and what you could do for Bella Vista’s future. The incumbents for Mayor, City Clerk and Ward 1 have stated they plan to seek re-election. To run for a municipal office, one must be a qualified elector, a U.S. citizen and an Arkansas resident who is registered to vote. He or she must reside in the jurisdiction to be represented. He or she must have never been convicted of embezzlement of public money, bribery, forgery or another infamous crime. Bella Vista is a City of the First Class and operates under a Mayor-Council form of government. The mayor serves a four-year term, acts as the city’s Chief Executive Office and runs day-to-day operations of the city, including the administrative offices at City Hall, the police and fire departments, the Street Department, Community Development Services and the Bella Vista Public Library. The mayor’s is a full-time salaried position and is eligible for city benefits. The City Council members serve two-year terms and put in place the city’s legislation, codes and budgetary goals that the city’s staff works to uphold. They typically attend one work session and one regular meeting per month, usually at 5:30 p.m. on the third Monday and at 6:30 p.m. the fourth Monday respectively, but are also subject to attending special meetings on occasion. Their actions and activities as council members are subject to the Arkansas Freedom of Information Act, and meetings are open to the public. Their positions are paid an annual stipend but are not eligible for city benefits. The City Clerk is a part-time four-year position and is not eligible for city benefits. The clerk is the official record keeper for the city and attends all City Council meetings and council committee meetings to take and then prepare the minutes of each meeting. The City Clerk is responsible for executing formal documents of the city, including ordinances, resolutions, contracts, deeds, orders, notices, etc., and other duties as prescribed by law. To file, candidates must submit to the Benton County Clerk’s office a petition with no less than 30 signatures from qualified electors of the city in which the candidate files. 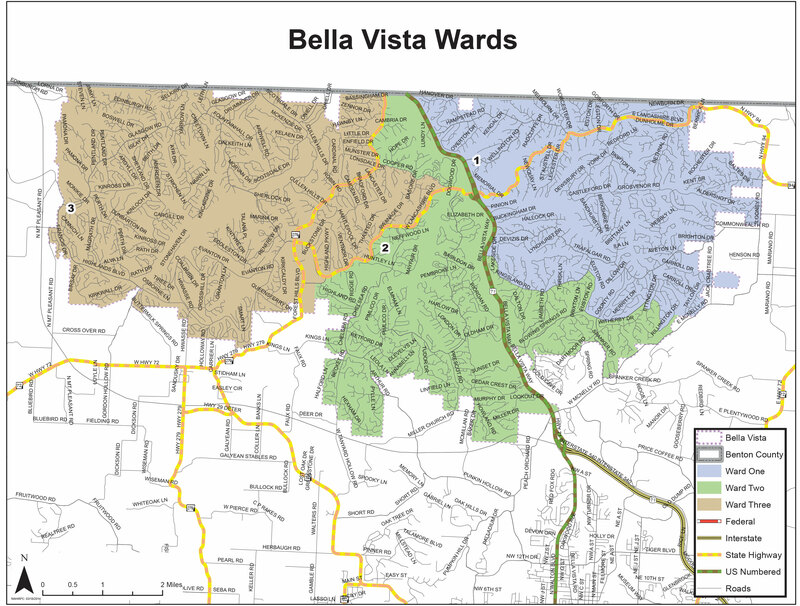 Bella Vista candidates are elected at large, meaning the entire population of the city votes for each candidate, regardless of the ward in which the voter lives. The 2018 filing period begins at noon Friday, July 27 and ends at noon Wednesday, Aug. 17. Early voting for the general election begins Monday, Oct. 22, and General Election is Tuesday, Nov. 6.